Good news! Schmidt Homes is back in the home building game. 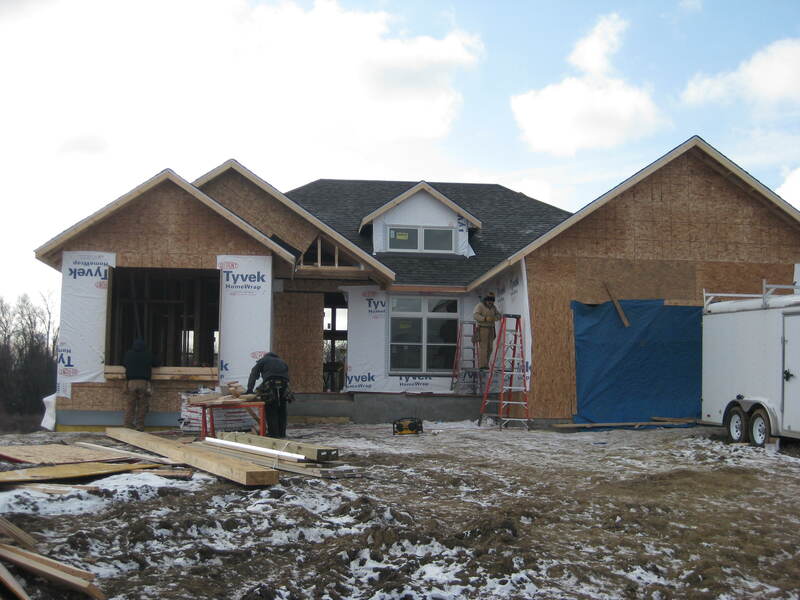 We are currently building a home on the north side of Northfield and we will be starting another next week on the south side of town. We feel very fortunate to be building again. These are pics from the home in Liberty Park. 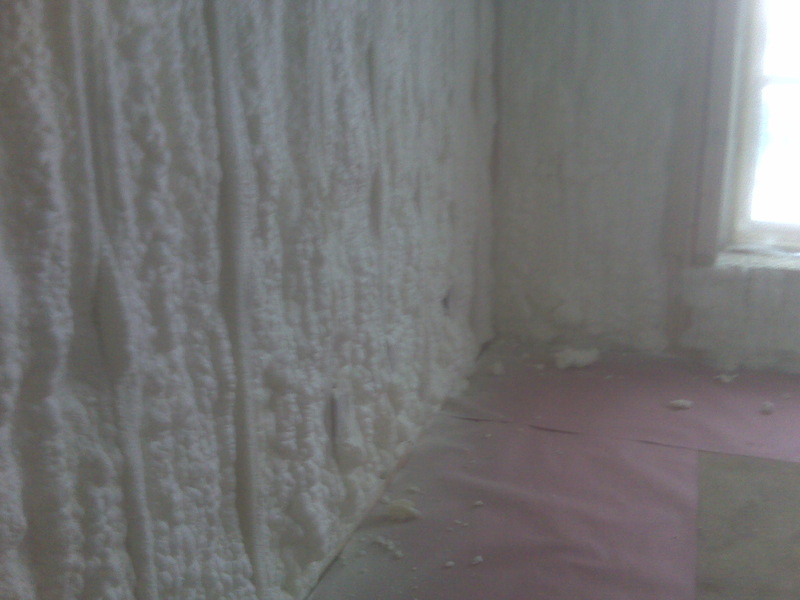 Last week we finished insulating. “Water, water every where… So let’s all drink some water!” Famous qoute from Homer Simpson right before he attempted to drink the ocean water when Homer, Ned, Bart, and Todd were stranded at sea. Yes Homer, 70% of the planet is covered by water. Unfortunately, 97% of the Earth’s water is undrinkable salt water and 2% of the water is frozen in ice caps. That means only 1% of the Earth’s water is drinkable. With a little help from Global Warming we can change that! I mean… If we continue to waste water at current rates, we will have to defend our precious 10,000 lakes from the Californians, Arizonans, and New Mexicans. There are a number of ways to prevent the complete depletion of our fresh water supply. First and foremost is to change our living habits. The average American household uses about 300 gallons of water a day compared to the average African household that uses about 5 gallons a day. Low-flow toilets – use 1.6 gallons per flush. Toilets consume 40% of the water in a home, that’s why if you make one household change, it should be to low-flow toilets. It is very inexpensive and saves you money down the road. Dual-flush toilets – two types of flushes, one with 0.8 gallons used for liquid waste and 1.6 gallons used for solid waste. After all there are two numbers, why shouldn’t there be two flushes? Low-flow showerheads – also very inexpensive to install. Low-flow showerheads may cut your energy bill in half! Tankless Water Heater – only heats the water that you use and does not constantly run. Off-Peak Water Heater – water heater that shuts off during hours of non use, while you sleep and while you’re at work. Check back about Graywater and Rainwater when Resource Efficiency comes up. And don’t worry about Homer and the boys, they found an off-shore drilling rig converted into a Krusty Burger. The Saturday’s Star Tribune featured a home where the homeowners blogged about the whole process, From Drawing Board to Done. 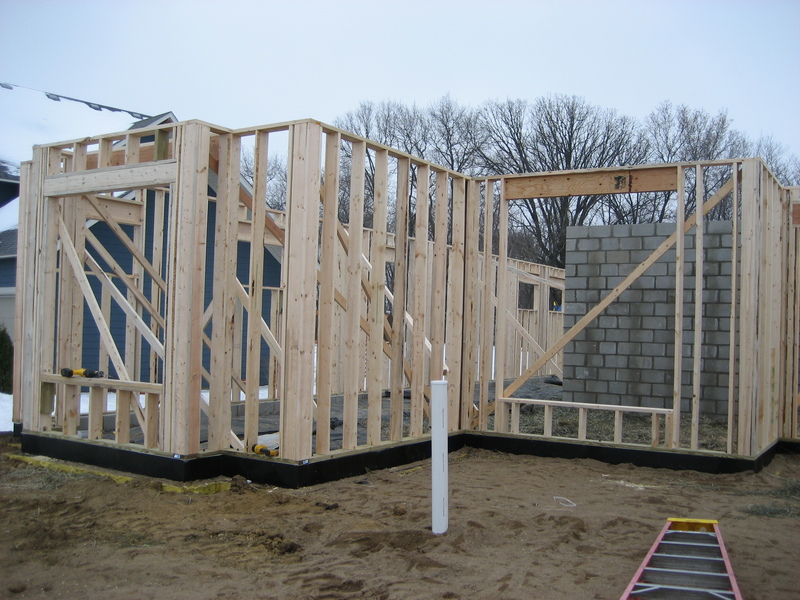 This page also includes great links to other resources about building a home. I recommend looking into if you’re thinking about building your dream home. 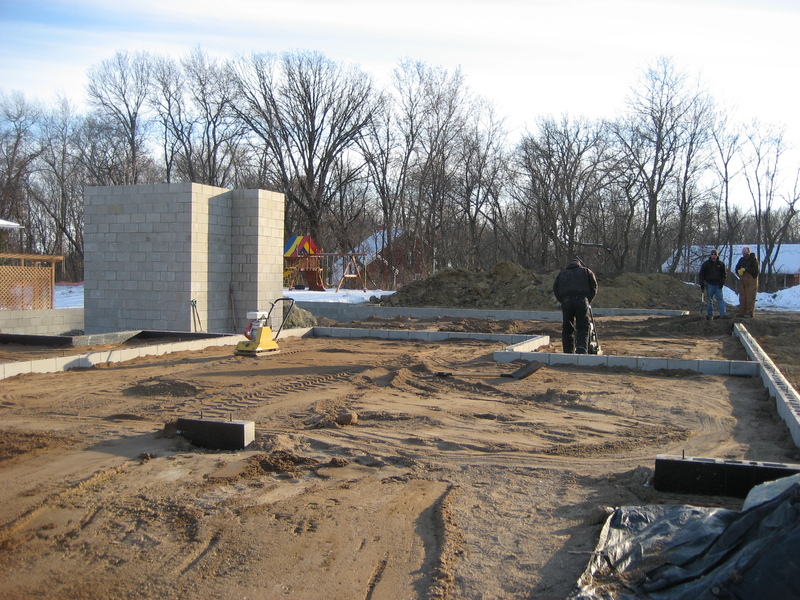 We are just staring interior framing for a new home on Quie Lane in Northfield. It’s a slab on grade with radiant floor heat in the whole house. They will have a heat pump attached to their air conditioner to help reduce their heating bill. When it’s 45 degrees early in the morning they won’t have to run the radiant heat they can just turn on the heat pump to stay warm until it’s 80 later in the day! One more option in building an energy efficient home. The cement block walls that look like an elevator shaft is the mechanical room and storm shelter. Since this home doesn’t have a basement we build a shelter for them on the main floor. The exterior walls being framed up. 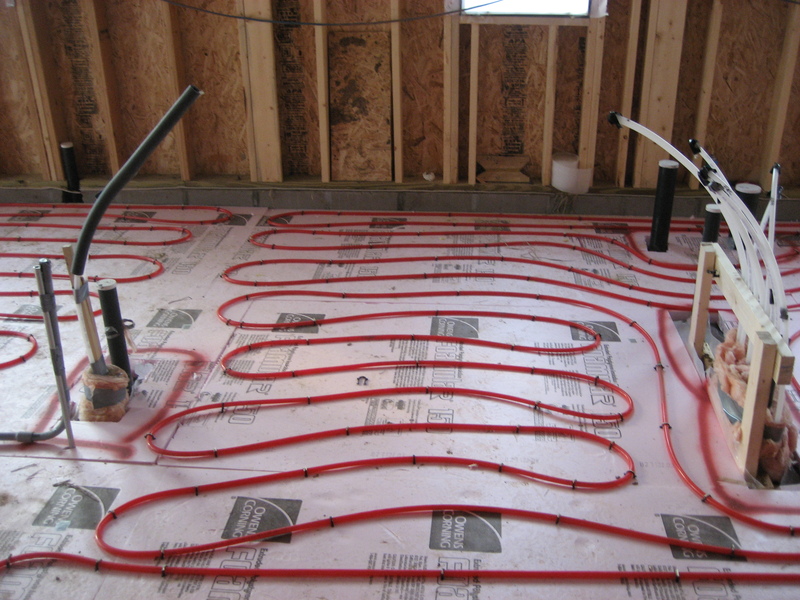 Radiant tubing in the laundry room before the cement floor is poured.